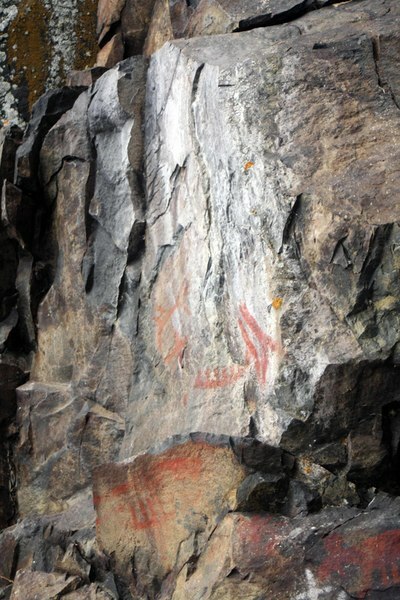 We have visited the site on 5 different occasions and have spent approximately 30-35 hours at the site; ‘Muzzinaw-Bee-Egun Sagagen’ or Painted Images Lake is its traditional aboriginal name. 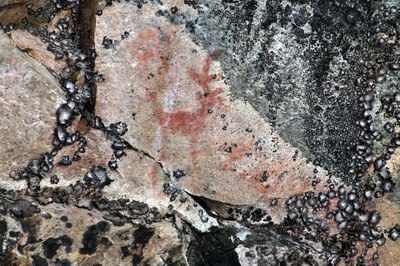 The site itself has retained the name Fairy Point, after the little wild men, the Maymayqwayshiwuk, who were thought to have painted the images found there; the other lake located east of Missinaibi that is associated with the maymayqwayshiwuk is Horwood Lake…the pictographs here essentially destroyed by damning of the lake. The most comprehensive inventory of the entire site demonstrated 236 individual images spread out over a half mile on 30 different panels. In order of frequency: 114 abstract/geometrical symbols (by far the most common are tally marks), 64 aged images too faded to interpret, 31 zoomorphs (animals), 10 anthropomorphs (human figures), 9 stars and celestial objects, 9 canoes, and 1 possible plant image. Conway writes of 3 particularly important panels that stand out because of their content; 1) the Caribou and Mishipizheu panel, 2) the Moose and Star panel, and 3) the Nanabush and Black Wolf panel; To this we would add a fourth panel of significance…the so-called Arms up-Arms down panel. These 4 sites correspond in order to Dewdney’s panels IX, IV, VII, and VI. Of all 30 panels, 2 are significant in that they show cardinal directions towards the northwest: 315’ and 330’; these are unusual panels in that nearly all panels across the Canadian Shield point from the east through the south to the west; north facing panels are rare indeed. 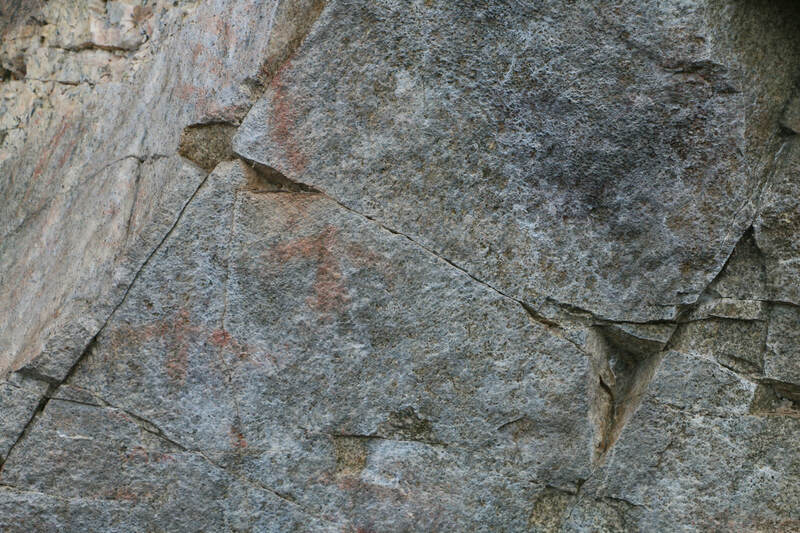 Because there are so many symbols spread out over such a long distance, there is a way to see Fairy Point in such a way as to make documentation easier. 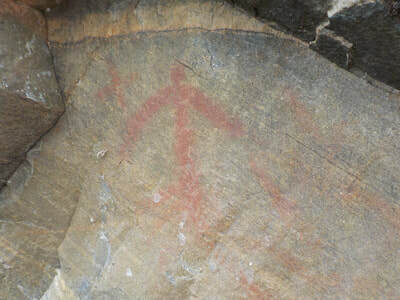 ​ We have divided the site as such…at the far left (north) lies a bird track image, then the double white cross panel, then the jumping moose panel, then the main panel, then the arms up, arms down panel, followed by the man with wolf panel lie in between, and lastly a way out to the far right (south), the serpent and sturgeon panel. The great majority of images belong to the 5 larger panels in the middle of the site, but there are faded and isolated symbols in between these that need to be carefully looked for. 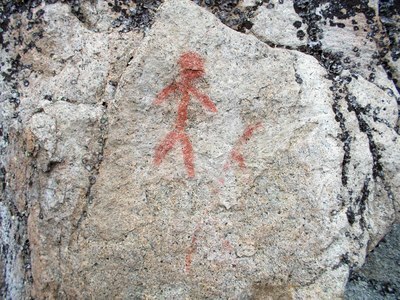 A summary of our findings is presented in a Monologue. Please contact us. MARY ISLAND SITE: first discovered by a fellow archaeologist in 2015; no Borden Number, no registration, no documentation, and no research done; limited photos. 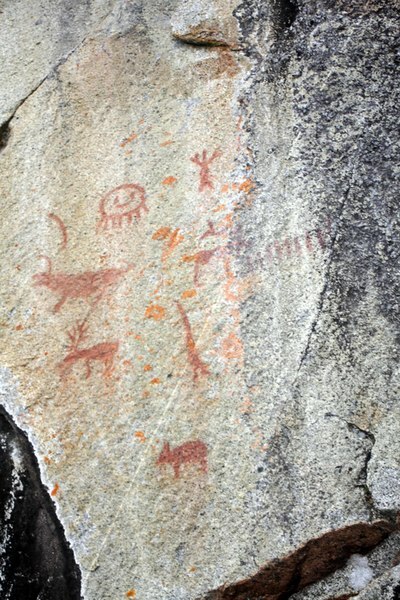 We are not aware of any ethnohistorical data available on the site. 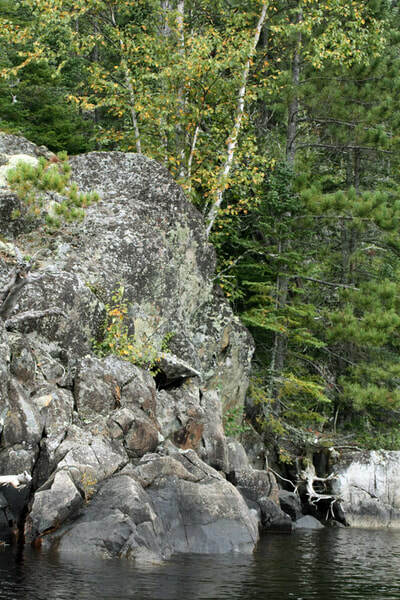 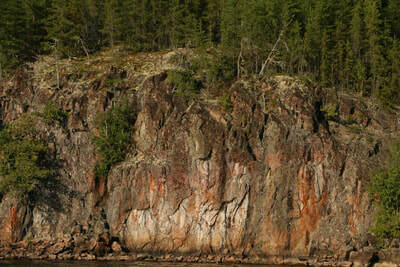 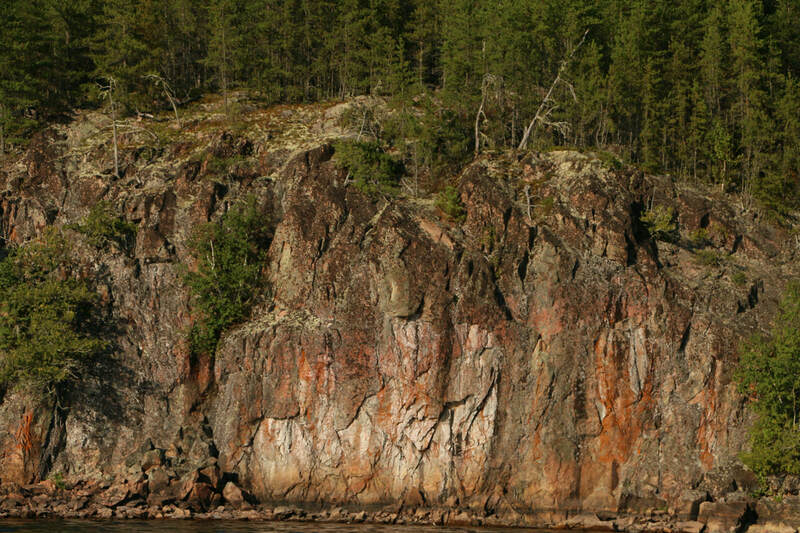 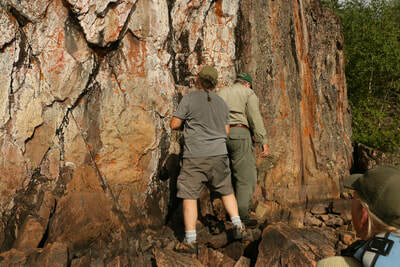 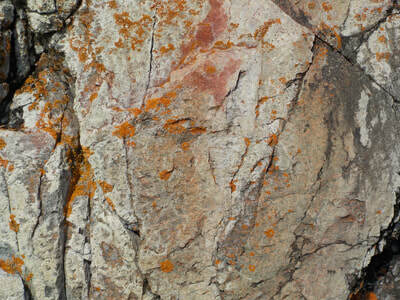 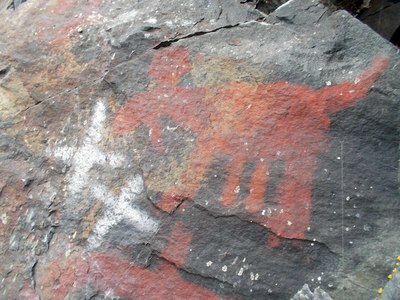 This is 1 of the 4 known Missinaibi Lake pictograph sites. This site is the smallest and perhaps the most mysterious of the four. 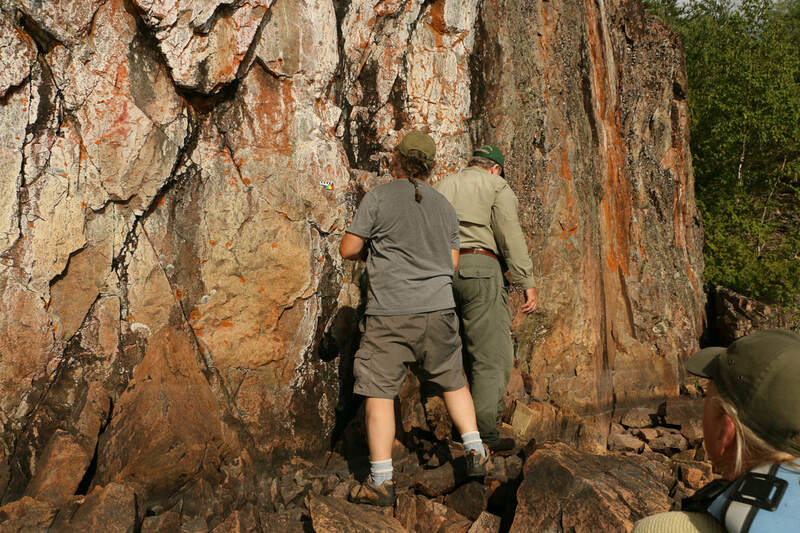 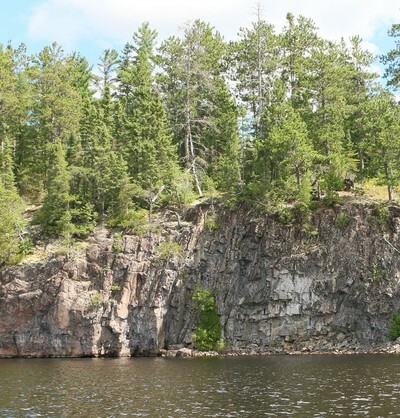 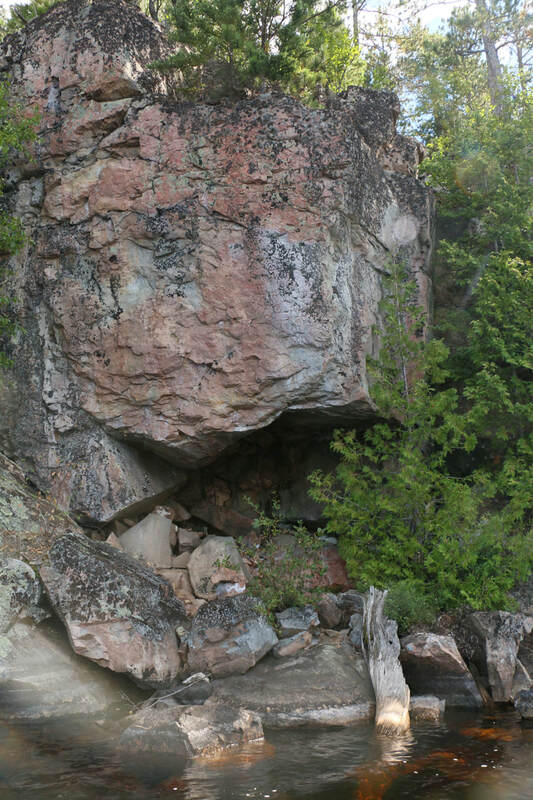 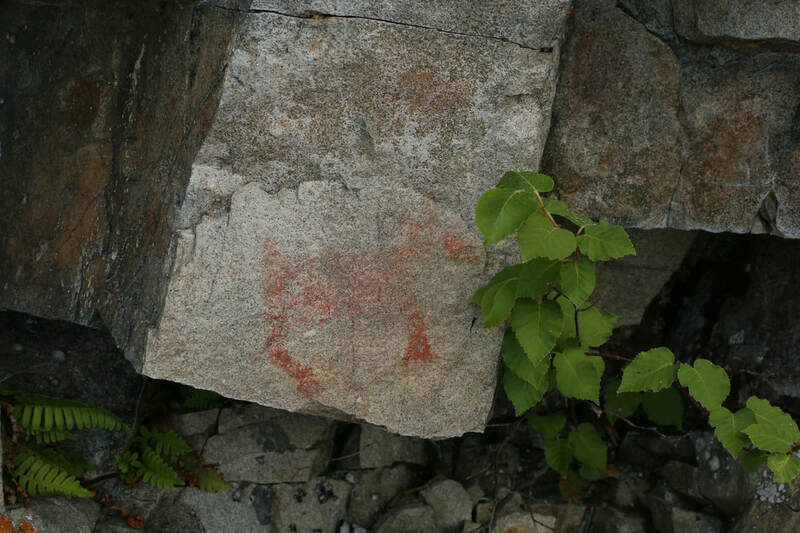 This site was discovered by an experienced pictograph hunter, in 2015 while searching the rock cliffs of Barclay Bay on Missinaibi Lake. ​We have visited the site on only two occasions, so there is certainly room for a few more visits to tease out its hidden details and mysteries. The site features 5 panels. 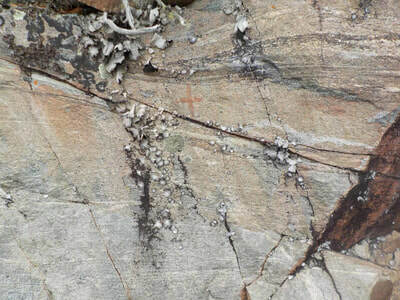 Symbols here include an evergreen shaped plant image, with a vague shape below it, and to the right a possible cross with some short ochre strokes; the plant image is slightly obscured by rock tripe as well as some green lichen on the left; approximately 30 meters distance between this panel and the ‘arrow’ at the other end of the site. 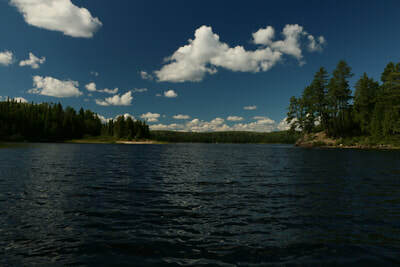 The island itself is a mysterious apparition on the southwestern horizon when viewed from Fairy Point on a stormy day looking out over the steep waves rolling over the deepest part of the lake. 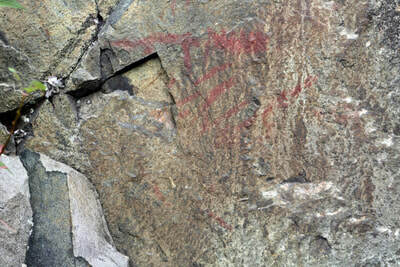 The Pictograph Site is not located on the Island. 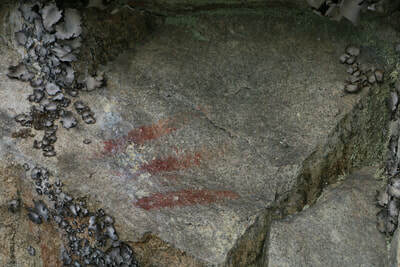 It is a single, small site located on a small, low, west-facing rock cliff located on the mainland just east of the Island and opposite the culturally sensitive sand beach located on Reva island. 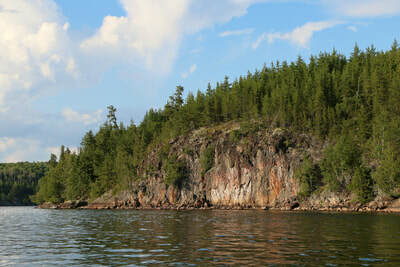 The Island itself is considered a burial site for the Ojibwe. We have visited the site on 3 different occasions; on the first we found many white tobacco ties strung on the branches of an old dwarf Cedar growing above and beside the small rock site. 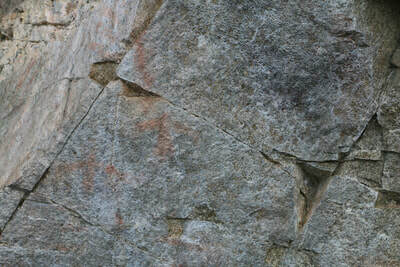 ​We consider there to be 3 small panels at this site. There are several interesting aspects ; the appearance of a plant symbol, the commonly seen triad of thunderbird, canoe, and serpent, a cross image, and the presence of offerings in the form of tobacco ties. The Whitefish Falls pictograph site is one of 4 known sites on Missinaibi Lake in traditional Ojibwe territory; it is located at a crossroads for the south nastagwan route from Little Missinaibi to the big lake, and is almost equally distant from the Fairy Point site and the Mary Island Portage (also called Nadoe or Iroquois Portage…a crossing where the Iroquois could avoid detection by the Ojibwe lookouts at the top of Fairy Point). 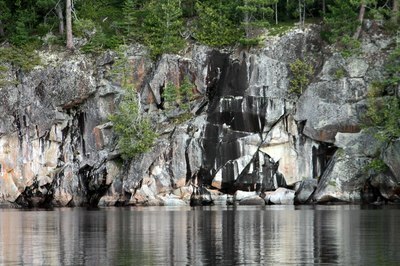 This is a small pictograph site located on a west facing headland/point/bluff at the entrance to a medium-sized bay where the little Missinaibi River drains out at Whitefish Falls that can be difficult to observe due to the prevailing winds and waves; one will appreciate the calm and tranquility of this bay when one paddles into it and out of these prevailing winds; we have seen periods where 3 foot waves gaining height over the long fetch of South Bay and the mid-lake area are crashing along the base of this site. It’s traditional aboriginal name was ‘Wiasitchuan’…meaning ‘water shining from afar’ and is quite appropriate when one looks into the bay from the far side of Barclay Bay on a sunny day. 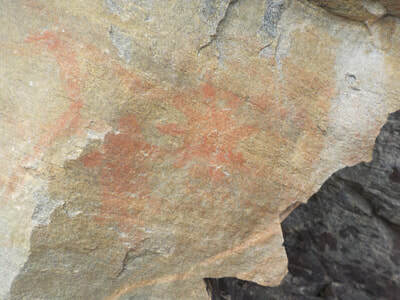 Although it is a small site that faces west towards a culturally-sensitive beach gathering site at an impressive bluff location, this is an important site…no reference to fish or plant symbols but including 2 bird morphs and a burning sun/face image unique to this area of the Ontario Shield. 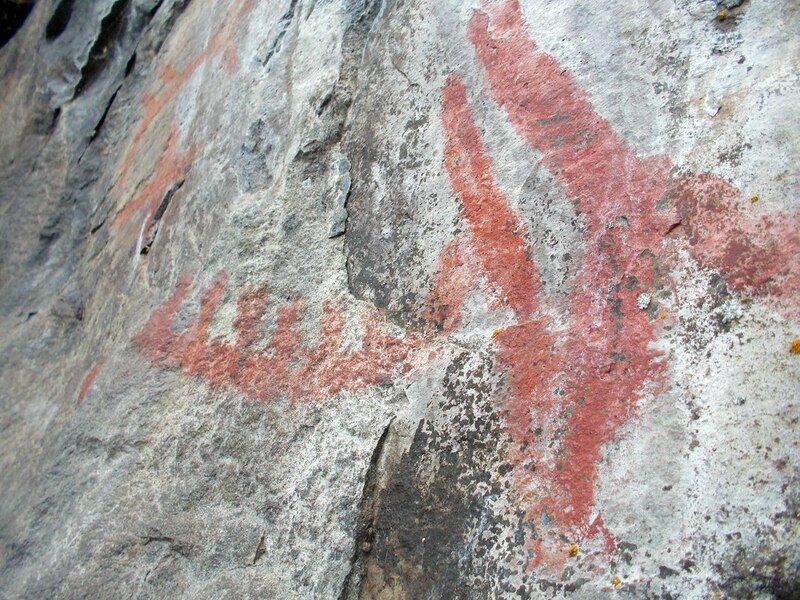 ​This is considered to be a major site within Mattagami traditional lands east and south of Missinaibi Lake and Chapleau in the Gogama Forest (Makami Lake, the Tarheel site and the Grassy Knoll site on Upper Grassy Lake, Ferris Lake, Horwood Lake, Big 4 pictograph site, Arrow Rock, Ninth lake). The Anishinaabe held this site as highly sacred; not on a traditional canoe route where it was seen and passed by often; somewhat out of the way requiring some travel to visit. 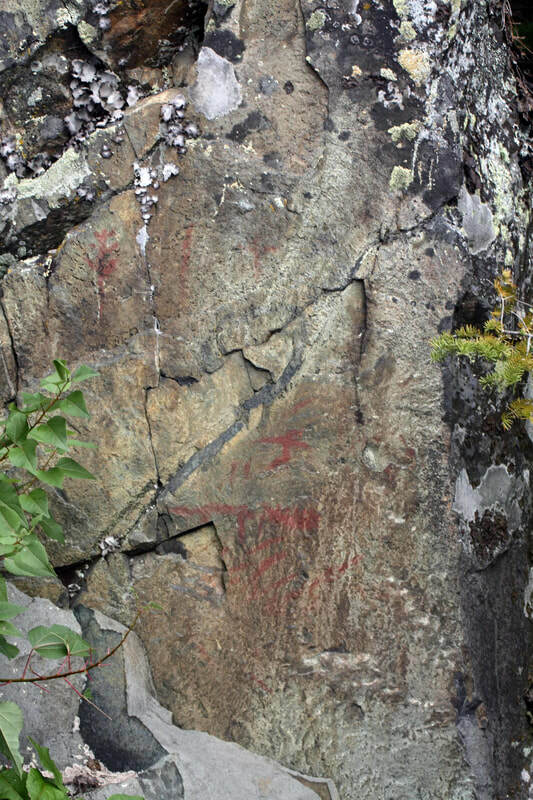 Extremely interesting site; somewhat atypical in it’s location…a low lying, irregular rock cliff site, west facing, with a main panel, a single faint serpent-like morph north of the main panel on a white quartz intrusion, and some sacred symbols south of the main panel. 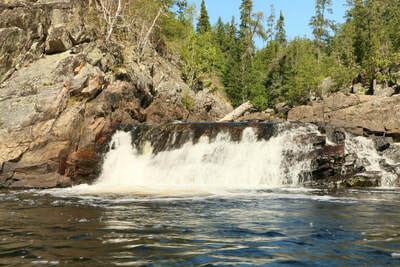 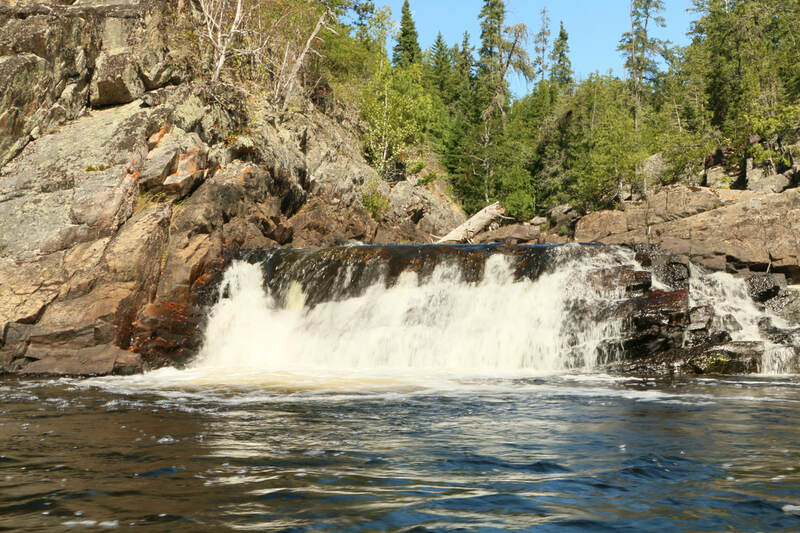 Located on the East Spanish River in Mattagami area within the Gogama Forest; Spanish River flows south from the height of land to the North Channel of Lake Huron. 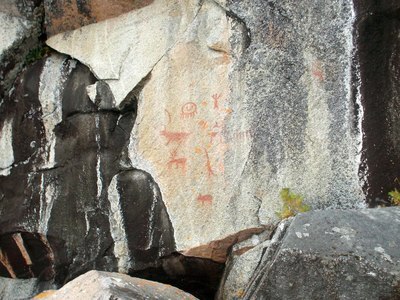 Only known pictograph site on the Spanish River system; Ninth Lake and adjacent areas of the Spanish River were part of a main freight route to Mattagami in the late 1800’s and early 1900’s. 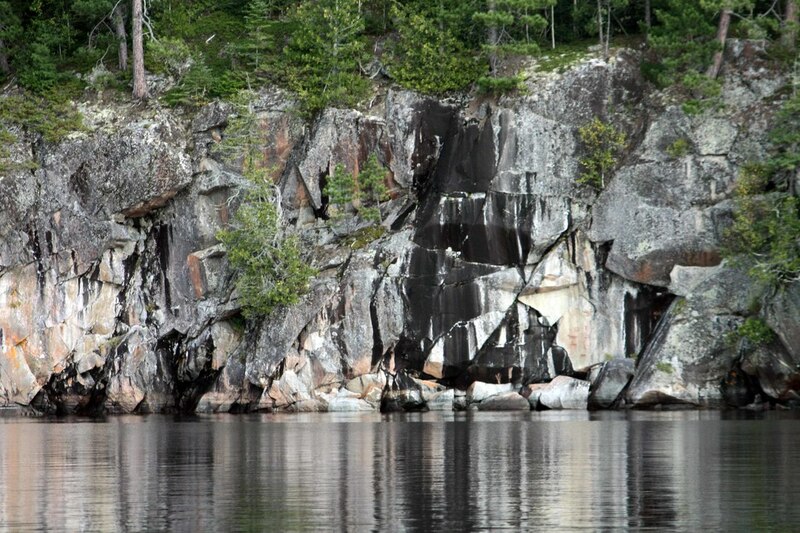 Easily accessed off highway # 144 about 5 kilometers south of the Watershed Restaurant at Duke Lake Road and campsite on the west side of the highway (1.6 kilometers in to the campsite); 7-8 kilometer paddle from Duke Lake through Tenth Lake and into Ninth Lake through 2 sets of shallows/swifts; several campsites along this route. 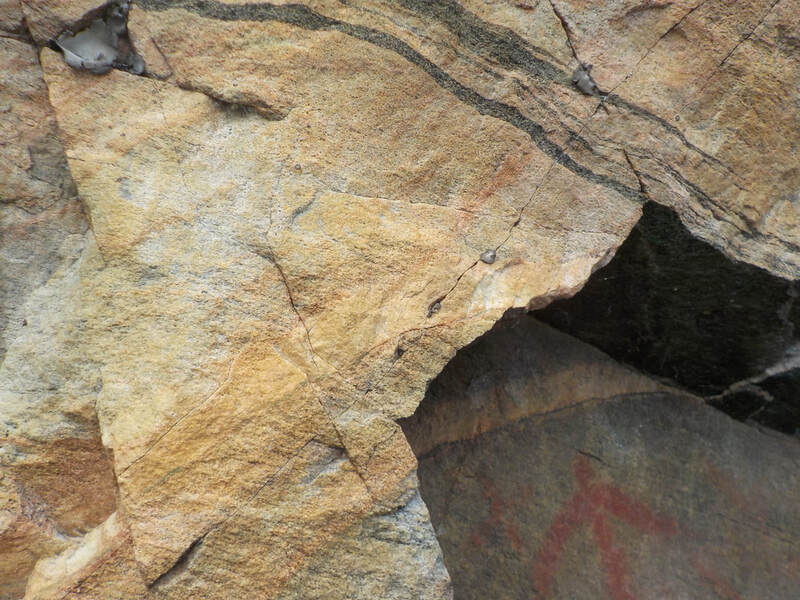 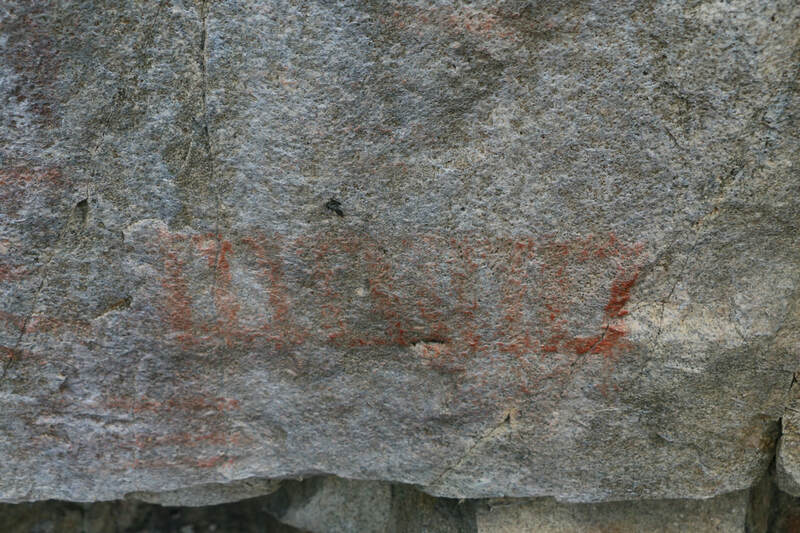 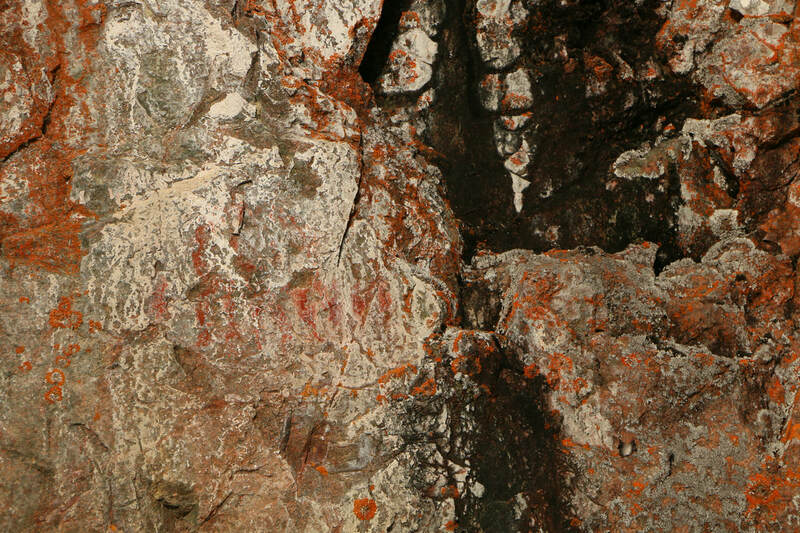 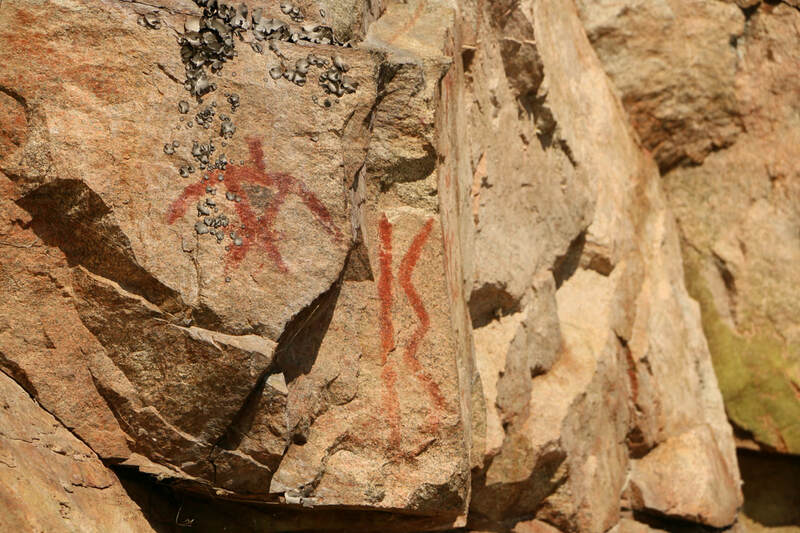 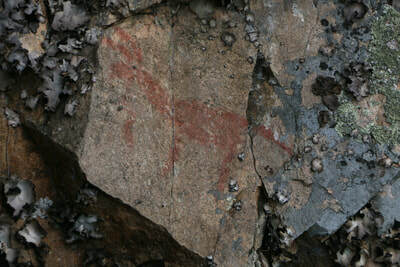 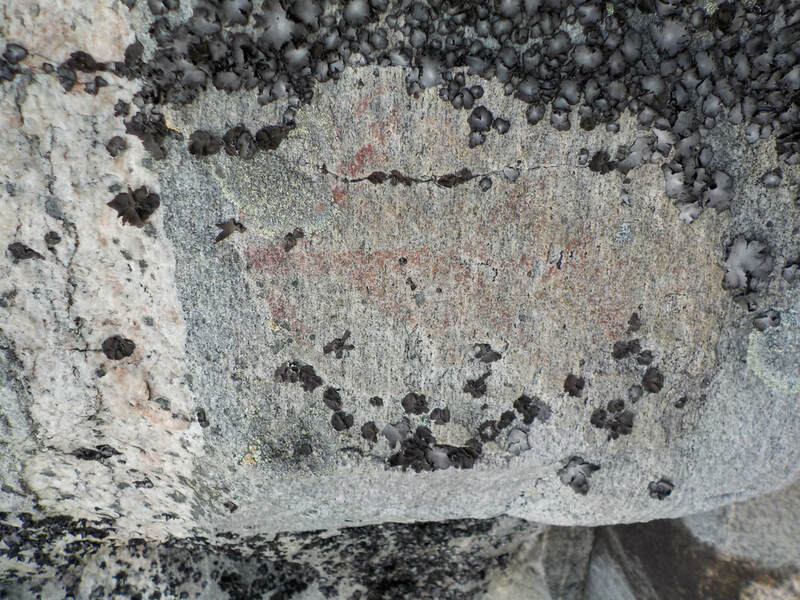 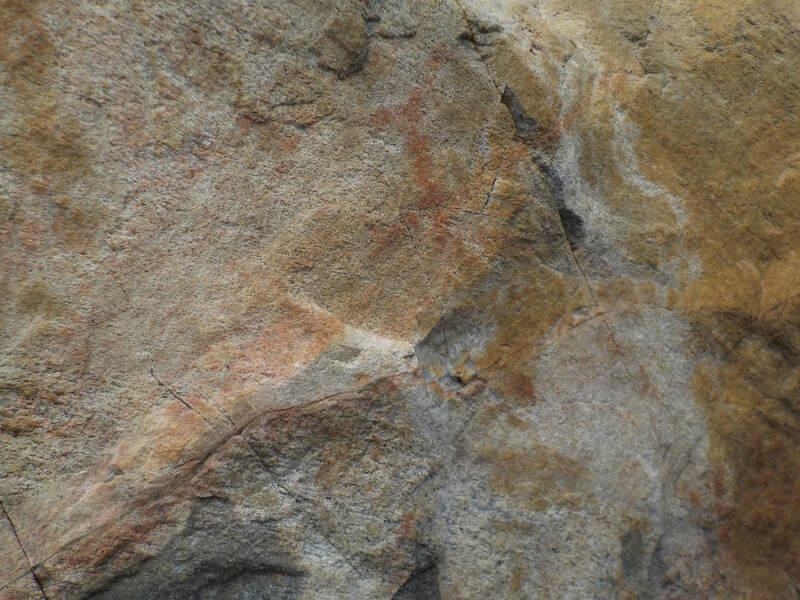 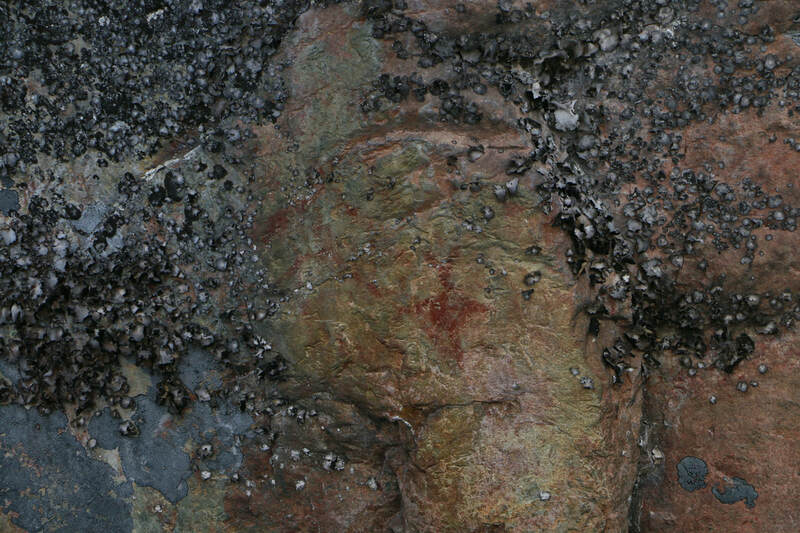 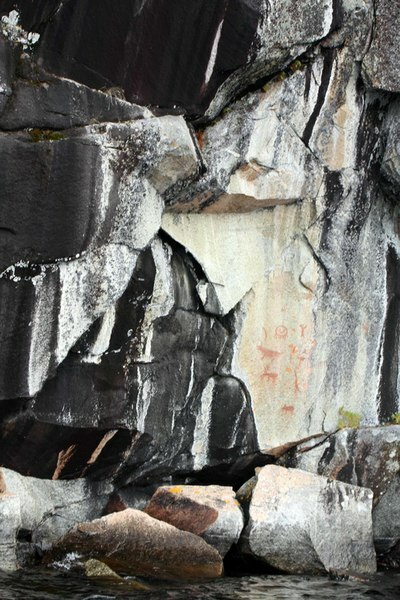 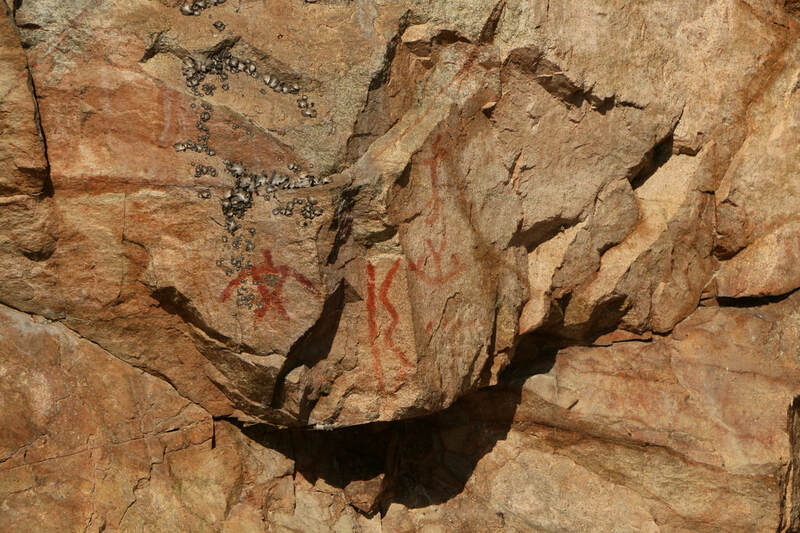 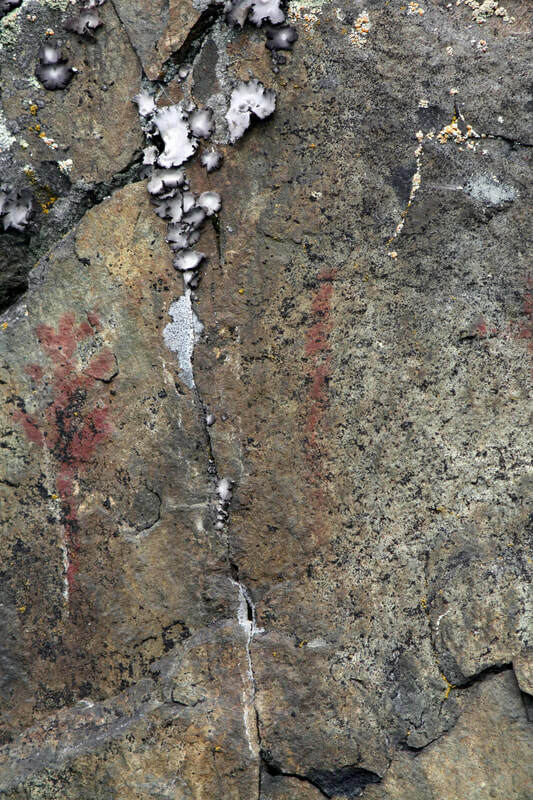 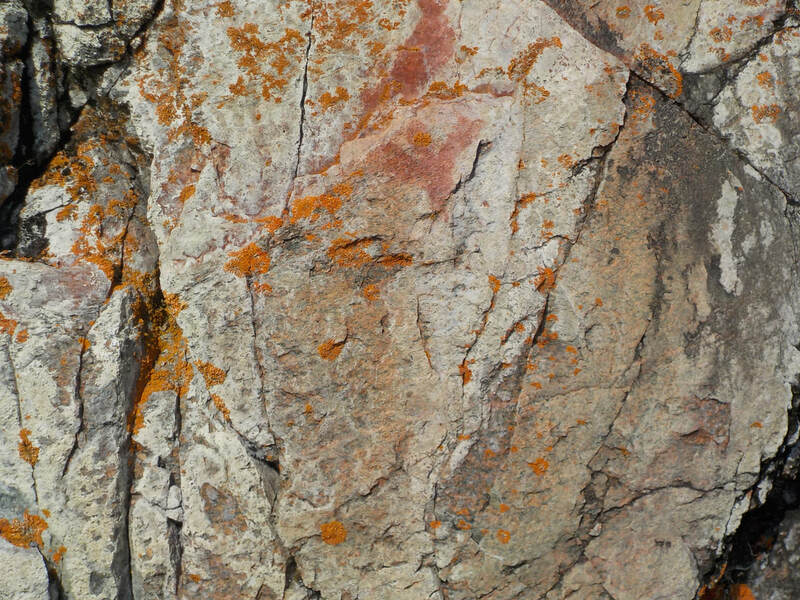 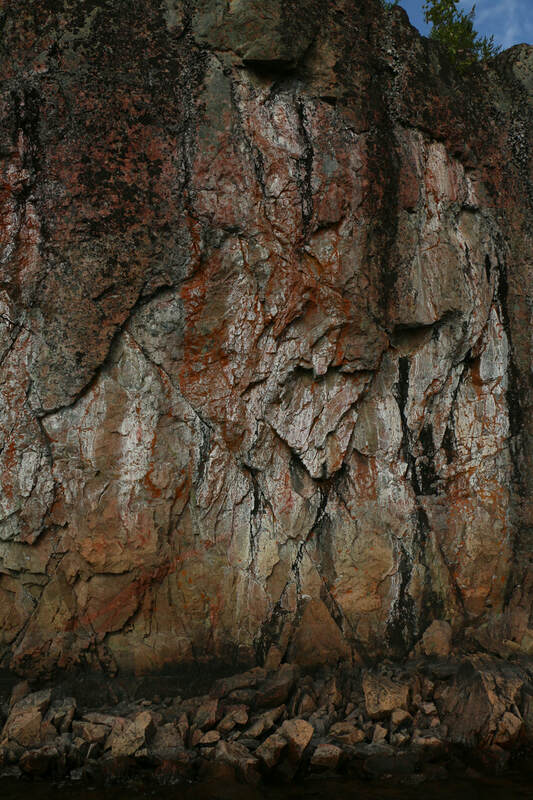 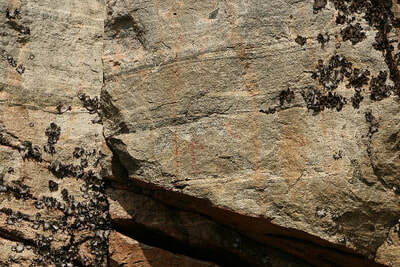 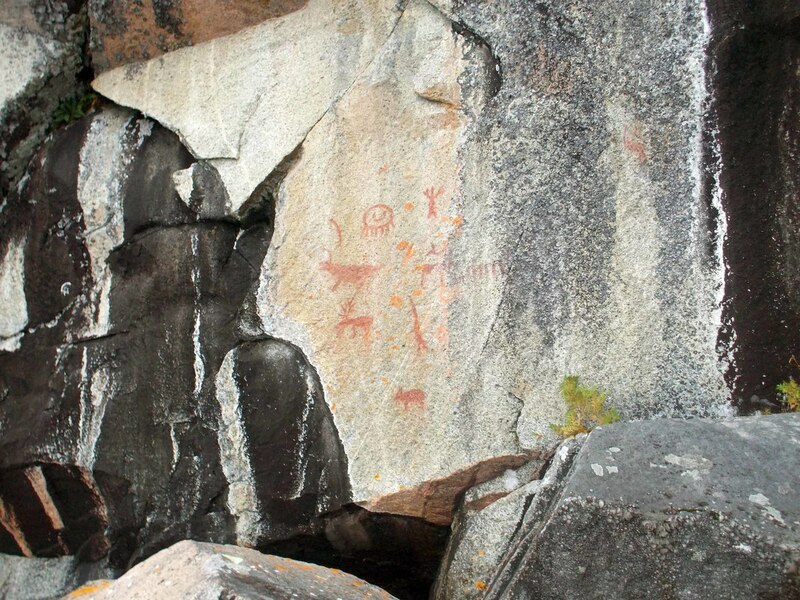 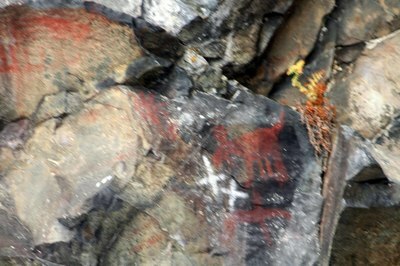 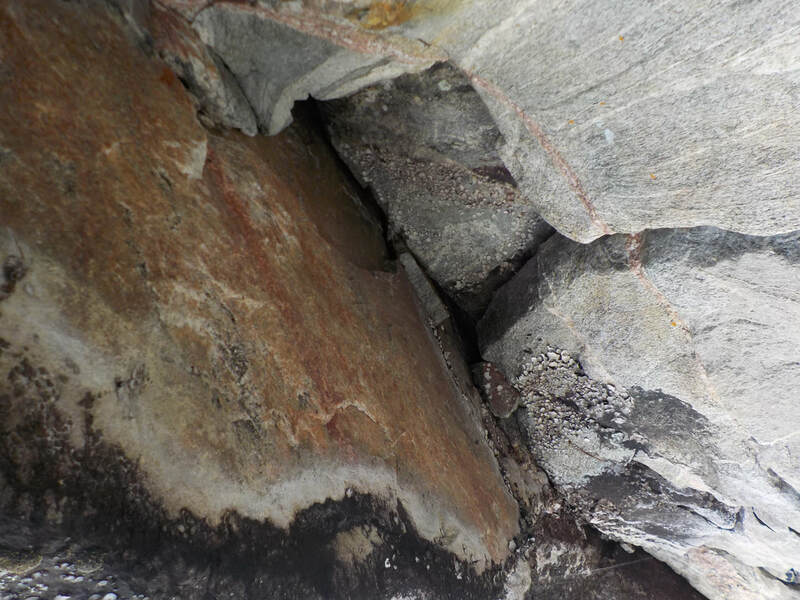 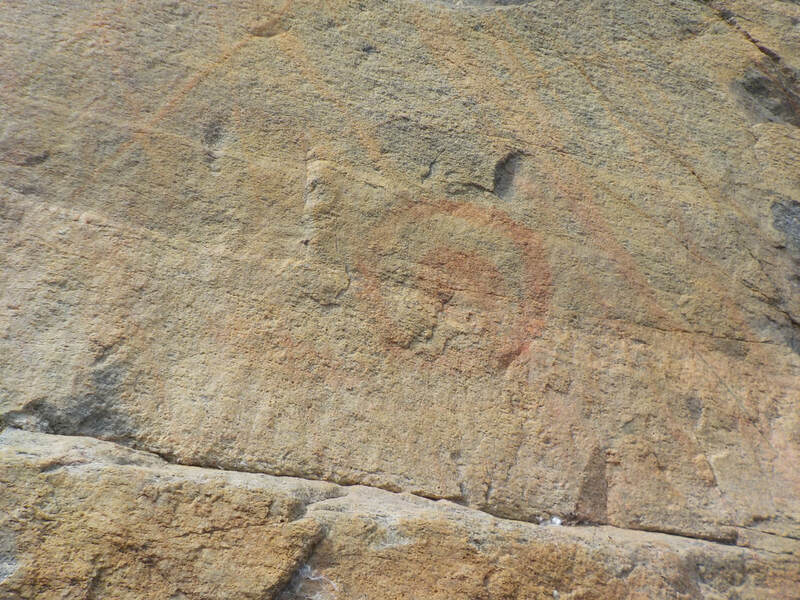 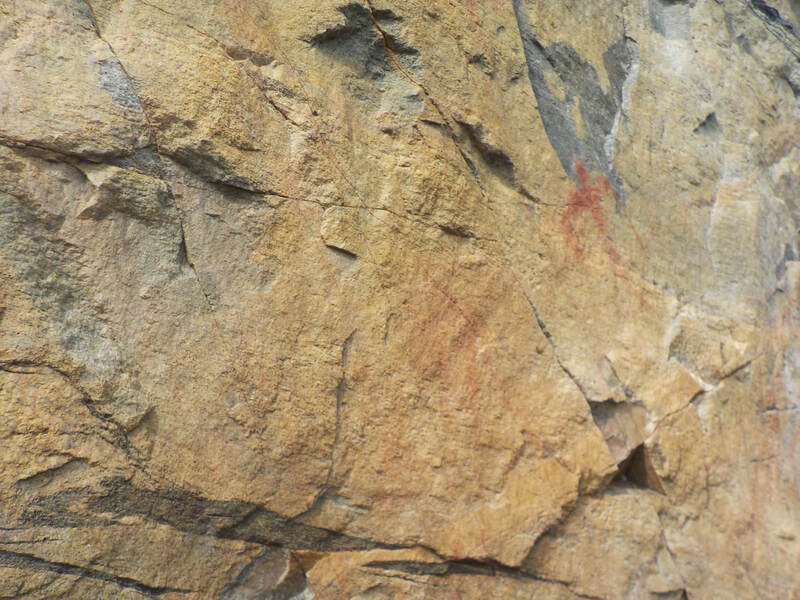 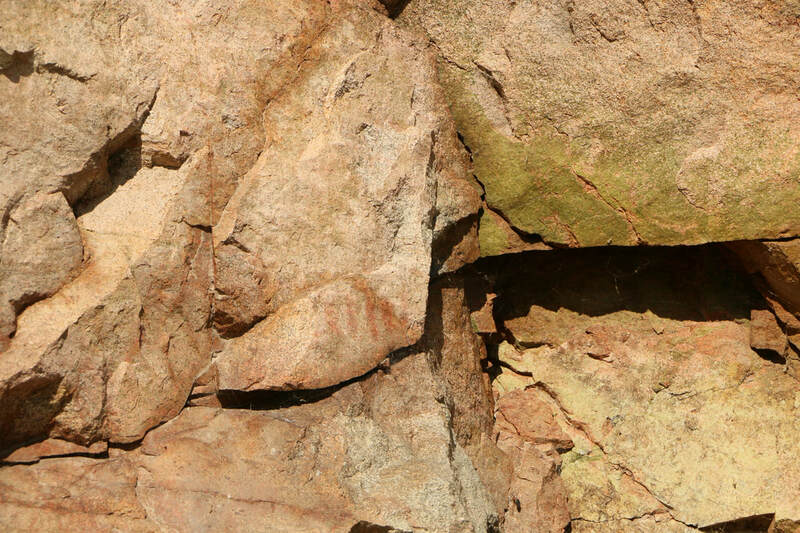 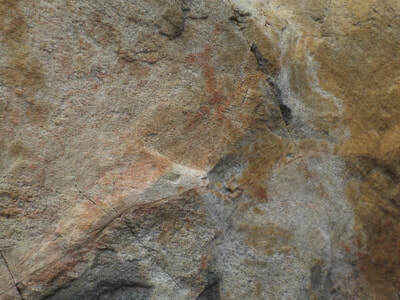 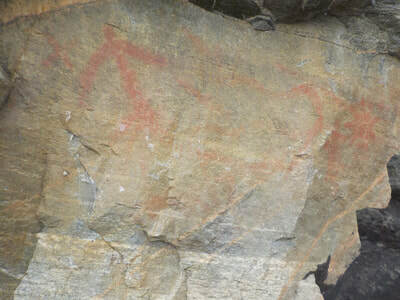 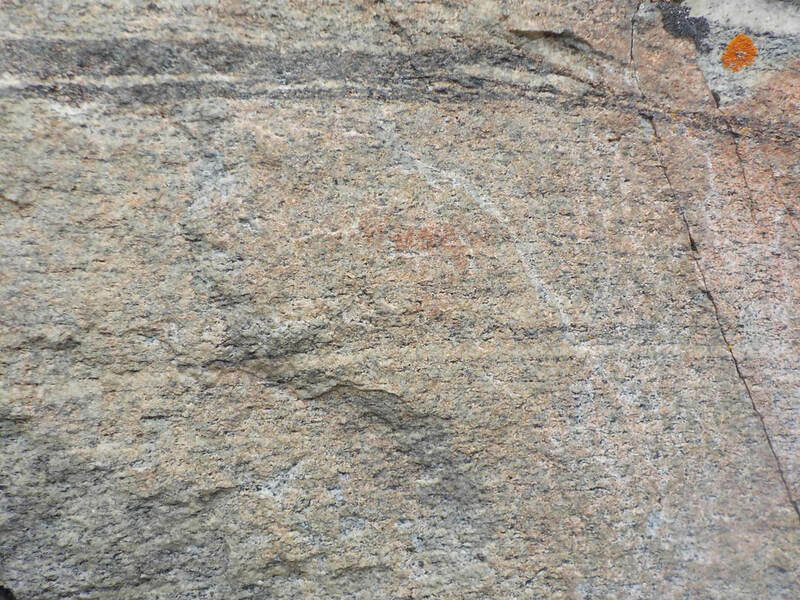 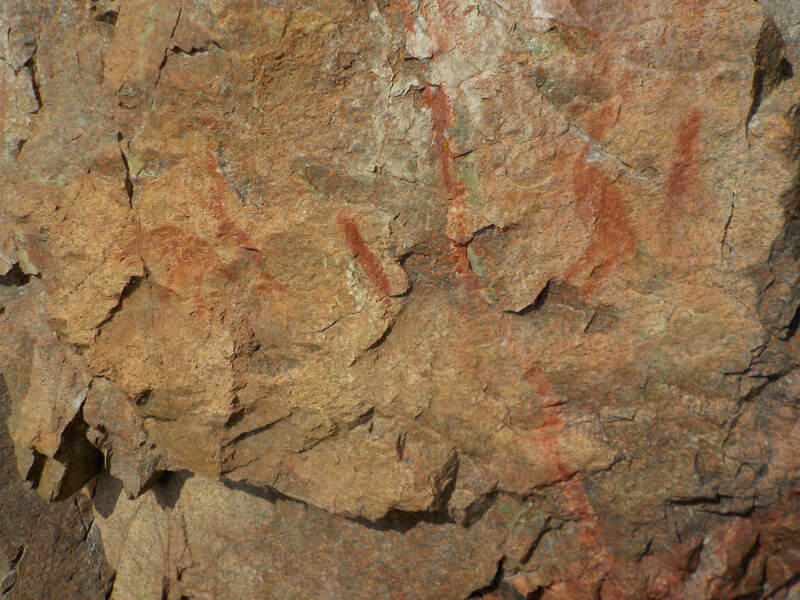 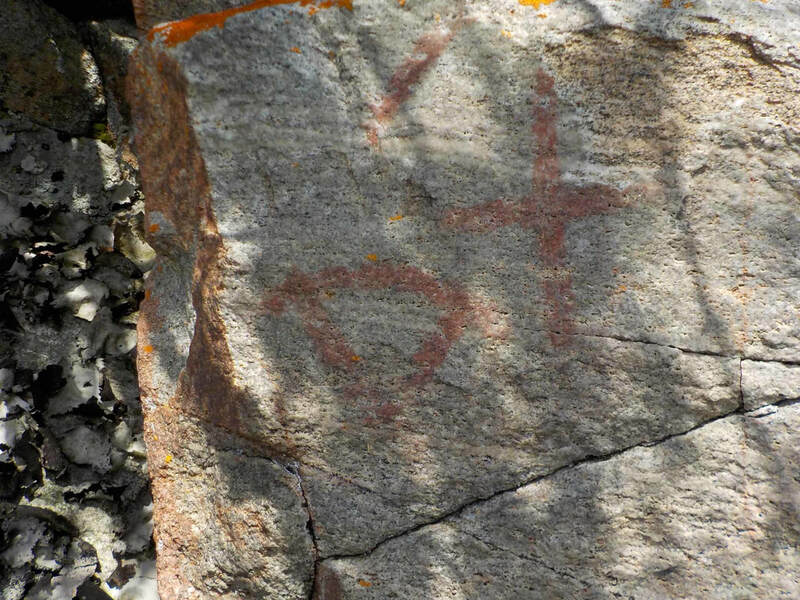 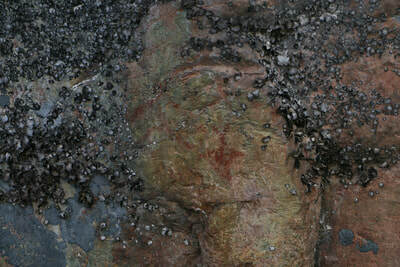 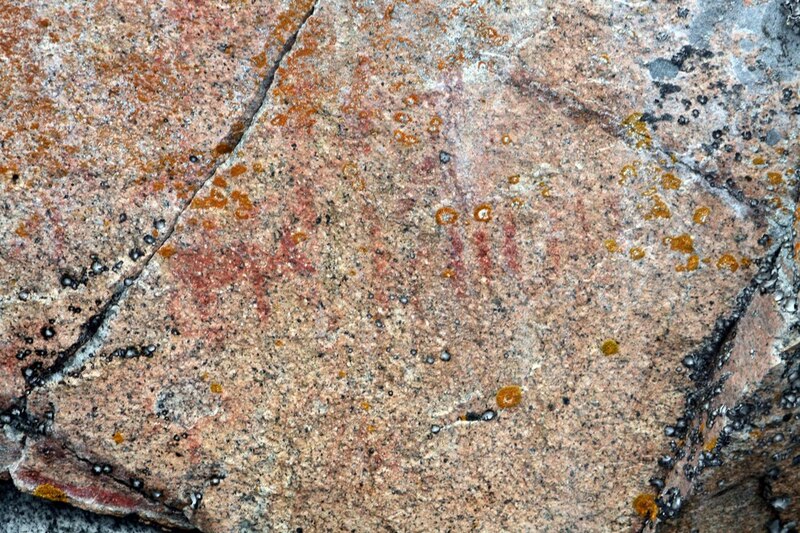 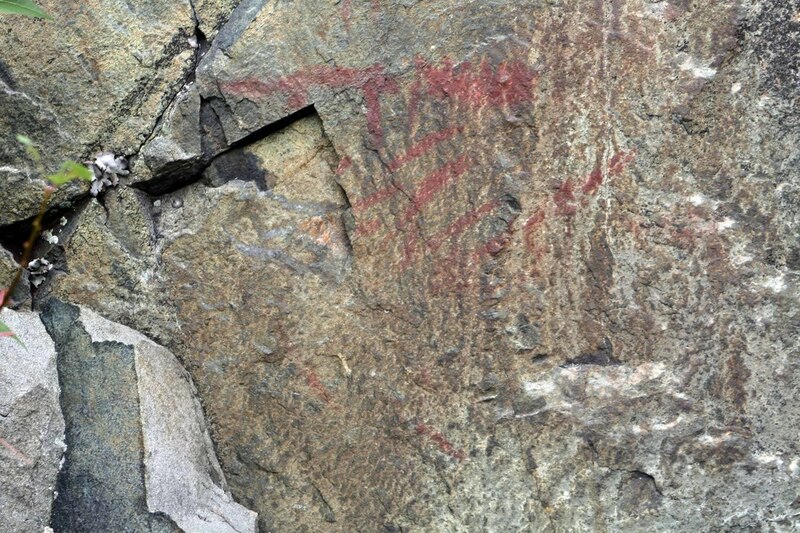 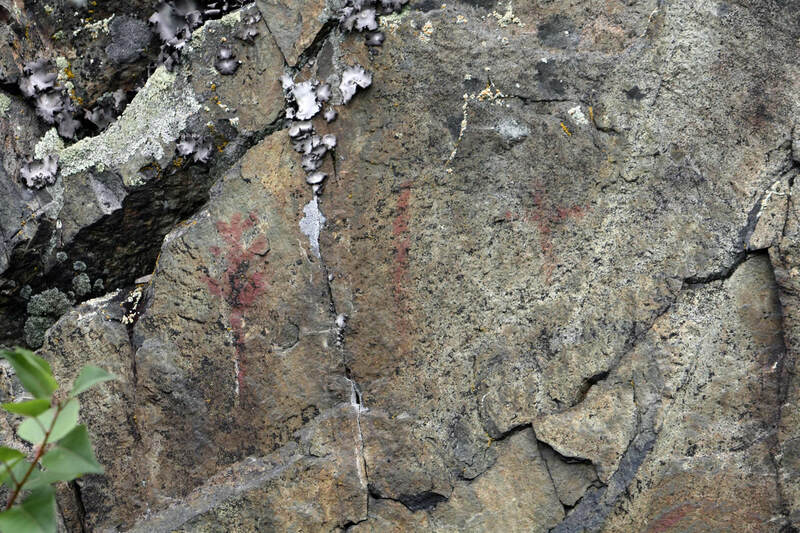 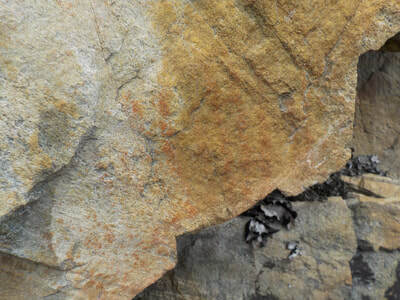 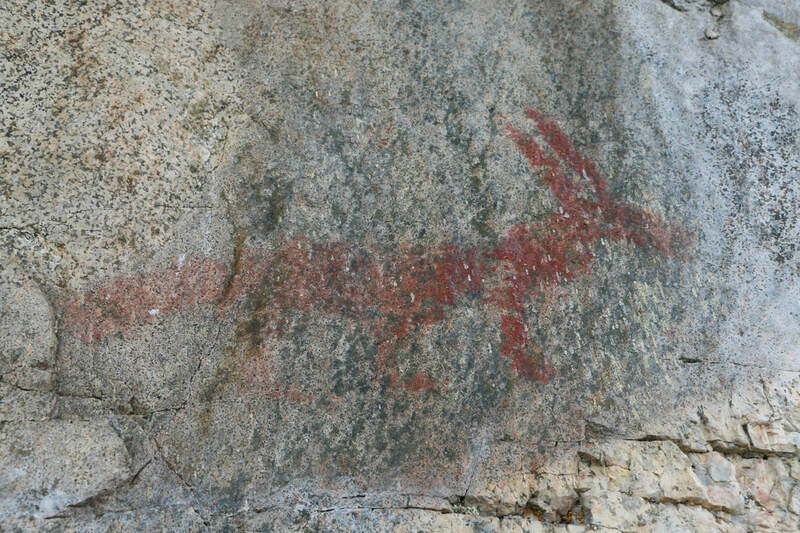 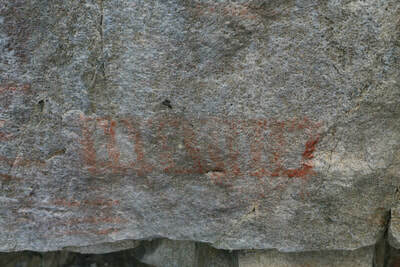 ​There is a single main panel of clear, vibrant, red ochre pictographs; MNR Gogama reported site vandalized with white spray paint with restoration in consultation with CCI; a yellowish, lighter colored rock face lying below an overhang is where these pictographs are found. ​Thunderbirds, snakes/serpents, canoes; Conway acknowledges 17 known symbols, and indicates 3 areas with pictographs; he listed 6 panels: panel 1: an open bodied thunderbird, panel 2: vertical line representing a possible serpent and a second crooked vertical line representing a second serpent, panel 3 with a zoomorph symbol painted above a canoe with an unusual central figure, and 5 solid painted dots located beneath the canoe, panel 4 has 5 short vertical tally mark lines, panel 5 a possible water bird ie. 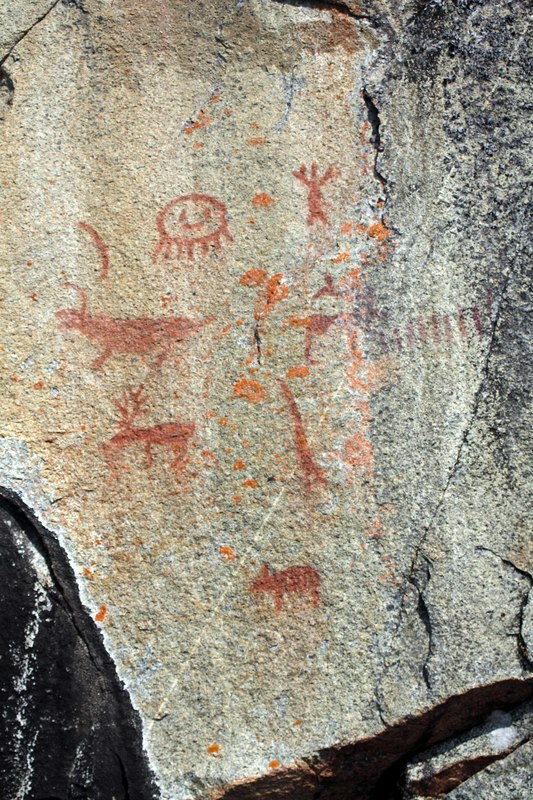 a loon, and panel 6…another canoe with at least 5 vertical lines representing passengers. 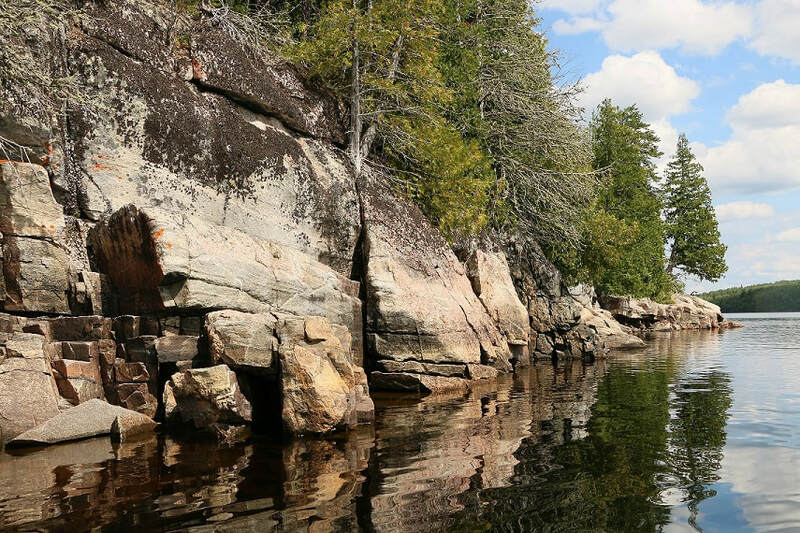 Like Wizard Lake, this is truly a northern ‘gem’ of a site…it’s a little further off the beaten track although still located on a known traditional nastagwan route…its location is close to the Dog Lake, Missinaibi Lake, and Little Missinaibi Lake sites, but few people are aware of the site. 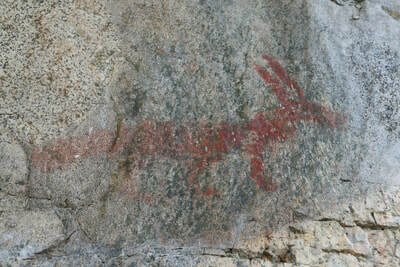 This site is both exciting and perplexing; within a small area of rock cliff lies an open circle with an inner dot, a star-like symbol next to a beaver/otter, multiple lines radiating upward from an ochre line painted along the edge of a rock (sunburst), a dumbbell-like image, a shell image, and a moose and fox associated with a long horned serpent, and the presence of over-painting has never been described or documented at any other pictograph site in North America let alone Canada. What the exact meaning of these symbols was remains in the thoughts and dreams of their creator, and there are few similarities to make us believe that whoever created these images were related to the creators of the Missinaibi, Little Missinaibi, and Dog Lake pictographs.